These are the words of Habonimana Emerace (22), a refugee from Burundi and a mother of two boys and a girl, explaining how she has met some of her basic hygiene needs. Like any woman in society, she wants to look good, to use body lotion and dress properly, but this costs money. Habonimana has been living in Nyarugusu camp, the North-Western region of Kigoma, Tanzania since May 2015, after President Nkurunziza's bid for a third term and the ensuing unsuccessful coup attempt in Burundi forced more than 150,000 people to flee. She gave birth to her two last children in the refugee camp, Nyarugusu has become a home to her children. 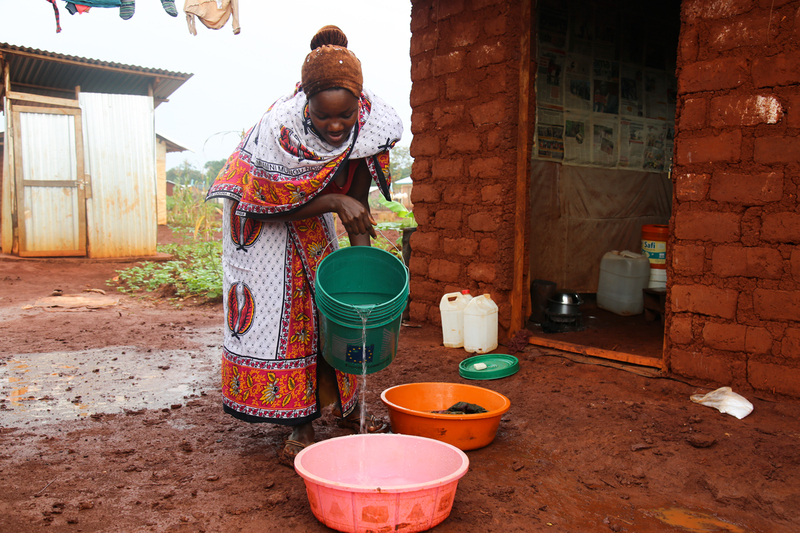 Habonimana Emerace wearing her khanga while pouring water from the kits she has received though European Commission’s Civic Protection and Humanitarian Aid funding, distributed by Oxfam in Tanzania (Photo by Kisuma Mapunda). 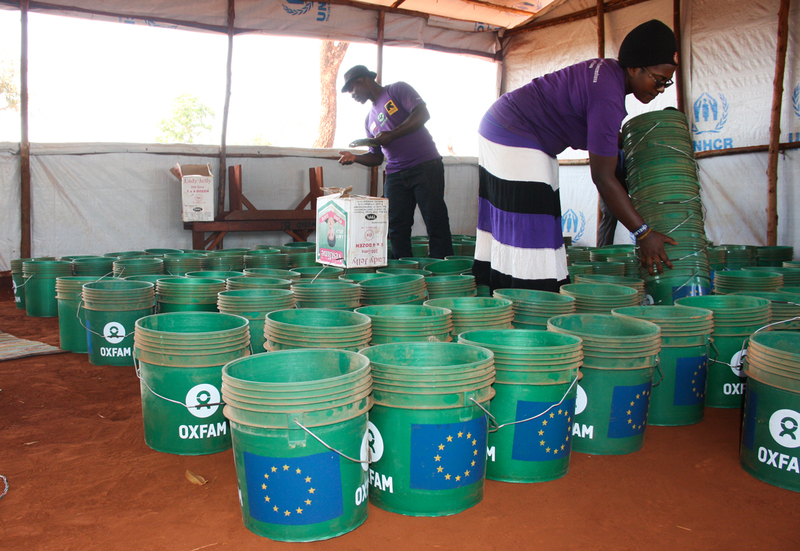 To meet some of her basic hygiene needs, the European Commission’s Civic Protection and Humanitarian Aid (ECHO) has been supporting her and 20,000 other Burundian women and girls of reproductive age living in the camps with dignity kits through Oxfam in Tanzania. The kit supplied comprises of buckets, under-dress, razor blades, soap, body oil, a face towel and a pair of khanga (local cloth). The last distribution of the hygiene kits was held in December 2017. It has now been three months since Habonimana last used cooking oil as body oil. “I don’t wear this khanga every day, I wore it today because I will be going to clinic. I only wear this when I am going out on special occasions. My last born is seven months old, I use the same body oil on him. I really need these kits,” explains Habonimana. There are times when she can afford to buy soap and oil but it costs $2 and only lasts for a couple of weeks. Her main source of income is from selling onions at retail price within the camp. She buys them from the camp market at the price of $25 in a plastic bag of 25 kilograms and packs the onions in smaller per size quantities for sale. “I sell at the retail price of between 25 and 50 cents for each five onions. Out of that I can make a profit of $ 4, but sometimes, I do get a loss. The money I am getting from this business is what I also use to buy my hygiene kit, but this does not happen often. In the past 3 months since Oxfam gave us women kits, I have saved six dollars which I can use to support my children,” narrates Habonimana. The fund by ECHO has supported 118,635 Burundian refugees in Nduta Camp and 69,275 in Nyarugusu Camp through multiple projects in Water, Hygiene and Sanitation. Enhancing menstrual hygiene management among women and girls is critical for protecting their dignity. Lack of access to female hygiene kits with sanitary pads has wide ranging implications including the rate of attendance of adolescent girls in schools. Copyright © 2019 Oxfam in Tanzania. All rights reserved.